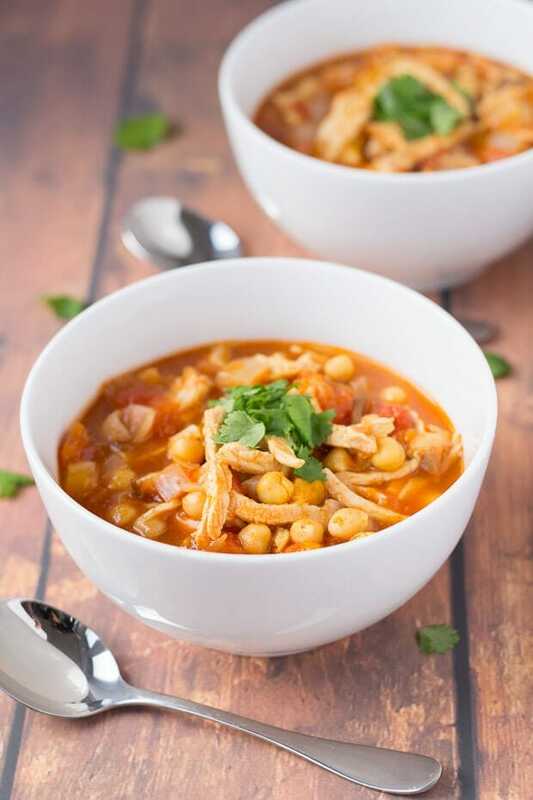 Easy Moroccan chicken soup is a delicious hearty and full bodied soup made from the popular spices of Morocco. Thick and comforting this is an easy to make all in one quick healthy meal. Hi Folks! 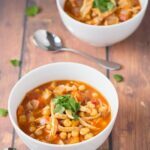 This easy Moroccan chicken soup recipe is my first soup recipe of 2018, and what a great soup recipe to start the year off with! I think it’s particularly appropriate at this time because of all the stormy cold winter weather we are ALL experiencing at the moment. You see for me, winter is all about hot, comforting soups. I mean yes I know I’ve told you that I eat soup practically every lunchtime no matter what time of the year, but in winter it has to be a particularly sole warming soup to hit the spot. A soup that makes you glow from head to toe when you experience the first spoon full. One that makes you forget about the cold dark short stormy days outside and helps you to look forward to warmer days. So, this soup fits that bill perfectly! Its the unique combination of spices that really give this soup its bold flavour. The cumin, coriander and chilli powder just seem to compliment each other perfectly, I’m confident this amazing soup is one you’re not going to forget! 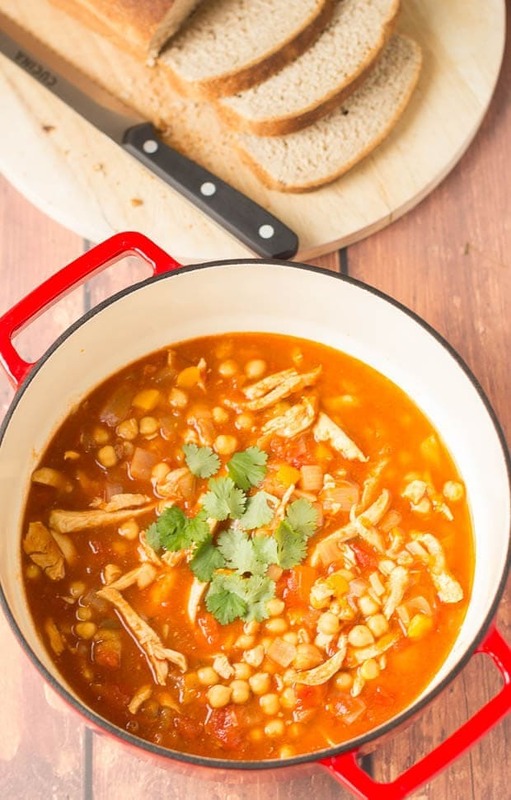 So now, where did the idea for this easy Moroccan chicken soup recipe come from? Did I have this soup in Morocco? Nope! Was this soup served to me in a Moroccan style restaurant? No, not there either. No, it was whilst working at our Dundee office last year, where I was unable to prepare and cook my own soup for lunch as I normally do that I went out and purchased a ready made carton of Moroccan chicken soup from a local supermarket. As I loved it I just knew I was going to have to try and recreate it at home. I looked at the ingredients on the soup carton and decided the list was too long and complicated. 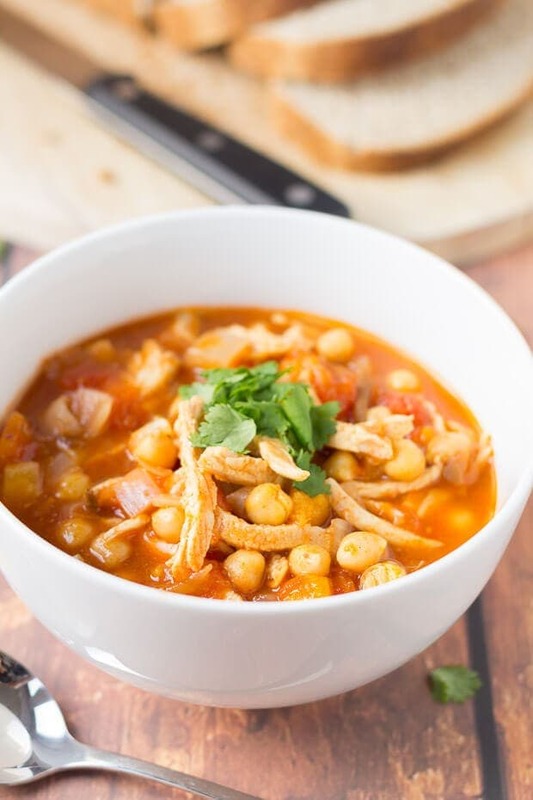 So I used what I thought were the essential ingredients (mainly the spices to give it its authentic smell and flavour) and the result was this, my easy Moroccan chicken soup. I really couldn’t taste any difference at all from the original shop bought one! Serve with some crusty bread (because you will not want to leave a single scrap of liquid in your soup bowl!) and you’ve got the perfect all in one meal! Whilst I certainly don’t want to claim that this Moroccan chicken soup is a recipe directly from Morocco, I have researched the spices and they are, so that’s what gives it its Moroccan identity. Oh, but I have however been lucky enough to visit Morocco though. So I have tasted their beautifully spiced food first hand. Moroccan Tagines mainly. They were my favourite and if you’re interested in trying some more Moroccan food in your own kitchen I seriously recommend my Moroccan Beef Tagine. If you’d prefer a vegetarian option then my Spicy Moroccan Chickpea Tagine is to die for! Lady Lynne and I visited Tangier on a day trip whilst on holiday in Gibraltar a few years ago. Plus I also visited several times when I was younger and living in Gibraltar when my dad was in the Royal Navy. I loved Morocco and it was then that I began to get the taste for travelling. I wasn’t so adventurous with my eating habits then though, but having been back since I’ve been willing (and wanting) to try anything. This soup reminds me of the smells and flavours as you walk through the spice market in Tangier. 400 g cooked shredded chicken breasts. In a large pan gently heat the olive oil then add the diced onion and sauté until soft. Add the cooked chicken, spices and the chickpeas (with liquid) and simmer for about 8 minutes. You could use leftover chicken or turkey to make this recipe. Next week we’re out with the spiralizer for a new spiralizer recipe Spiralized Kale Pesto Pasta, so if you’re looking to cut down on your carb intake at the moment then that one is idea for you. Then on Thursday a brand new sea food chowder recipe, Healthy Mussel Chowder which Rick Stein inspired me to put together! It can sometimes be a little intimidating to look at the ingredient list on packaged foods…but then you realize you can usually eliminate about half of the stuff as they’re just preservatives. 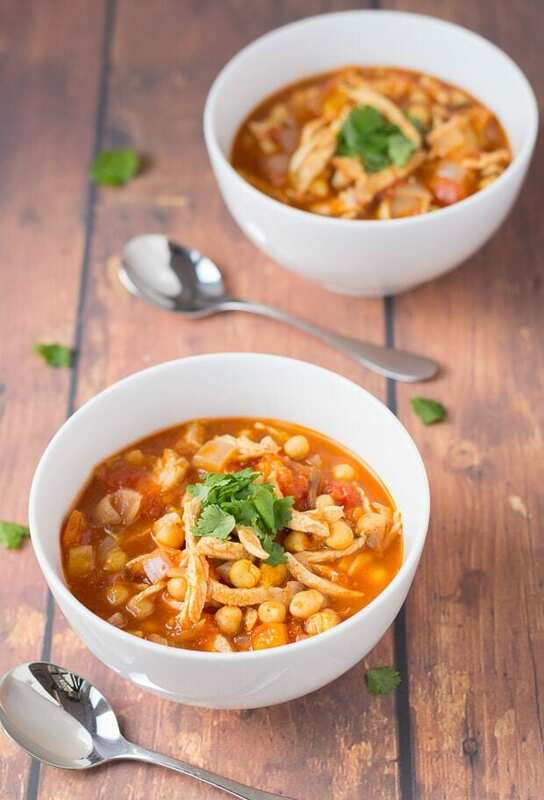 I love that you took that storebought soup and used it as the inspiration for this Moroccan Chicken Soup! This looks like the perfect comfort food on a cold day! And that spice list. That spice list. It looks amazing! If you happen to have leftovers, I’ll be happy to help you get rid of them. 🙂 Have a great weekend, my friend! That’s a hearty soup I think I could get behind (as a non-soup person)! Thanks Susie, yep this is super tasty. Those apricots and dates add a delicious amount of sweetness to compliment the spices. You would love it! Thanks Jeff, I know you’ve got some seriously good bread recipes that would be perfect for dunking into this soup! I’m always up for a good soup and this recipe is a must try, Neil! Is this a traditional Moroccan dish? Neil, I have never tried making my own Moroccan Soup – so glad you happened on that can of it and decide to replicate it here! I was half way expecting some exotic spice list but so glad that I have all these spices at home – all I need are those dried fruits!